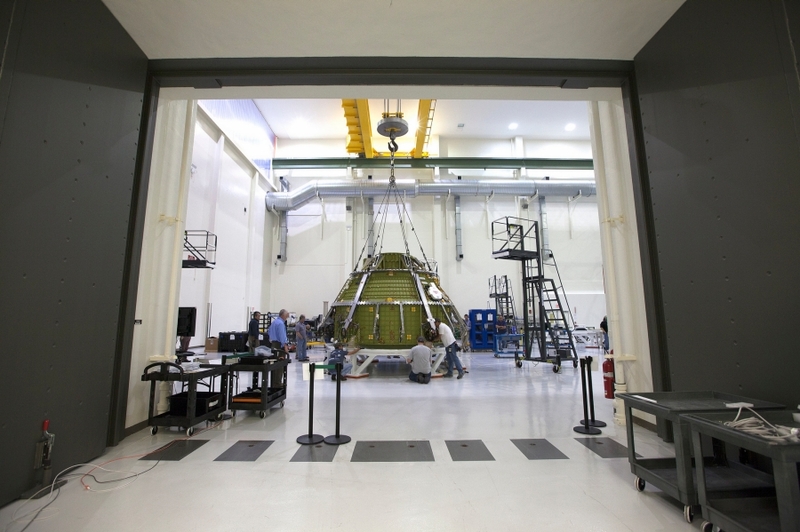 CAPE CANAVERAL, Fla. — NASA and Lockheed Martin have successfully conducted a proof-pressure test of the Orion spacecraft slated to fly Exploration Mission 1. The test of the crew module portion of the spacecraft is just the latest in a series of steps the spacecraft will undergo before it is sent around the Moon in 2018. The spacecraft’s crew module is where the astronauts will spend their time when they venture to a chunk of an asteroid towed into lunar orbit or to other possible destinations. According to a release issued by the prime contractor on Orion, Lockheed Martin, this portion of the spacecraft will serve as the backbone for many of Orion’s systems such as propulsion, avionics, and parachutes. For the proof-pressurization test, some 850 instruments were strapped to the spacecraft before it was placed under pressures some 1.25 times greater than what it is expected to encounter during crewed operations. Orion had an estimated 20 pounds per square inch (137.9 kPa) of pressure applied to the entire surface area of its interior to help ensure it is ready to fly the EM-1 mission. With this now complete, engineers will use phased-array technology to inspect the spacecraft to see if the welds held and to seek out any potential defects. It is hoped that this test will validate the vessel’s structural integrity long before astronauts fly in it. When the crew module’s primary structure is certified, Orion’s secondary structures, the spacecraft’s thrusters, its tanks, tubes, and other components will be added. When these secondary structures have been integrated with the spacecraft, the EM-1 Orion will be transitioned into the clean room where its propulsion, environmental control, and life support systems will be included with the rest of the vehicle. If everything continues to go as planned, Orion will be stacked atop NASA’s new super-heavy-lift rocket, the Space Launch System (SLS). The duo’s first mission is currently scheduled to be sent into lunar distant retrograde orbit in late 2018. This is the first planned flight of the full “stack” of SLS and Orion. EM-1 is slated to last for about three weeks and serve as, essentially, a shakedown cruise. In terms of what crew-rated spacecraft have done to date, EM-1 should be a mission like no other. Orion will fly around Earth’s Moon at a distance that no other human-rated vessel has ventured to before. 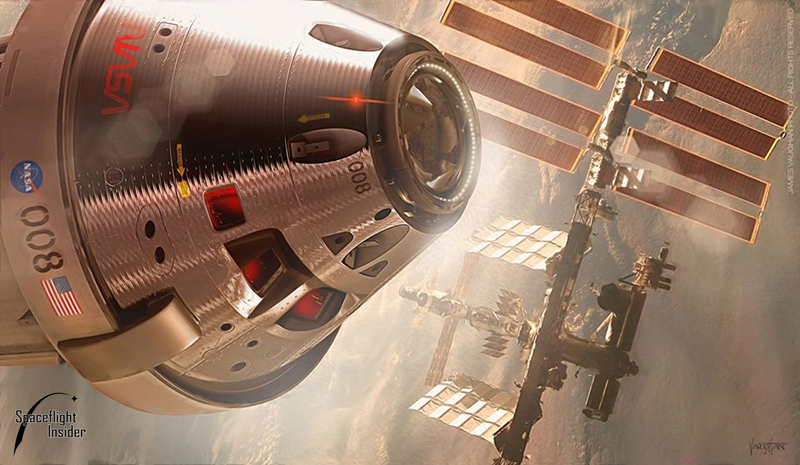 It is hard to get excited about the Orion capsule. It will carry a maximum of four crew, have a mission life of about thirty days, cannot survive re-entry from any trajectories beyond moon-return, uses an old fashioned (and not terribly efficient) in-flight abort system, has already cost untold billions,is so overweight that only the SLS could possibly launch it, and will fly — at the most optimistic projections — only once every two years. Yet all of this is glossed over while it is touted as ‘the heart of our new deep space exploration program’. Instead of continuing to allow congress to mandate pork barrel spending on this thinly-veiled jobs program, NASA and the taxpayer would be far better served spending a tiny fraction of the cash on buying CST-100 from Boeing, or Dragon 2s from SpaceX — and allow the rest of the money to be spent on other space tech programs. For example — besides Orion– what other payloads need a ride on SLS? With that kind of heavy-lift vehicle, we could send up some truly amazing instruments — but nothing is being developed, because funding is being misallocated. What do you mean, It’s hard to get excited about Orion. I’m excited. It sounds like you want another cancelled program at billions of dollars wasted, just like in the past. Could the politicians & NASA have done better? Yes. But, despite all the egos involved in choosing a system to go to cislunar space, it’s finally happening. To go beyond the moon, will require a multi-module solar-system exploration craft. SLS/Orion is not a complete exploration craft. It is the first part of an extensive infrastructure for BEO travel involving government, commercial & international partners. And this is only one BEO infrastructure. Commercial companies/other nations will be planning & building their own separate BEO exploration/utilization systems. Just my opinion.